New Delhi: Former Chief Minister and 67-year-old Ashok Gehlot is all set to take over the reins of governance in the desert state.Ending hours of speculation, his name was announced by Congress leader K C Venugopal here in a press conference in presence of both Mr Gehlot and Rajasthan Pradesh Congress chief Sachin Pilot. 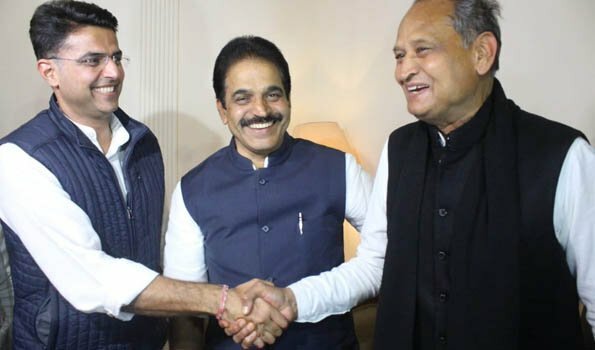 "Mr Gehlot will be new the Chief Minister and Sachin Pilot will be the new deputy Chief Minister," Mr Venugopal told reporters here.Mr Gehlot was the Chief Minister of Rajasthan from 1998 to 2003 and again from 2008 to 2013. Mr Gehlot's selection as the Chief Minister by Congress president reflects his faith in the veteran leader as the assignment as Chief Minister will need certain maneuvering because the Congress has managed a wafer thin majority in the 200-member assembly. Having won 99 seats only as against 73 by the BJP, the new Chief Minister will need the flexibility and acumen of a veteran politician like Mr Gehlot to run the show. Apparently, this subject figured prominently on Thursday's meeting Mr Gandhi held with two principalcontenders for the post Mr Gehlot and Mr Pilot, the Pradesh Congress chief and was onetime given out to be as the choice of the party high command.